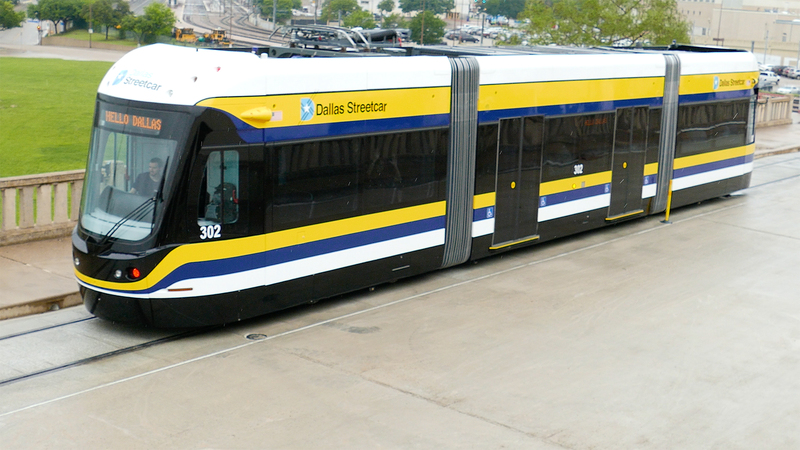 The Dallas Streetcar is a daily sight on the Oak Cliff landscape. Service begins at 5:30 a.m. and the cars run until midnight, making connections with the final DART Rail trains at Union Station. Trains operate every 20 minutes. To connect to DART Rail, a DART bus or the Trinity Railway Express (TRE) commuter rail, buy a Day Pass with the GoPass app, from a Ticket Vending Machine at any station or onboard the bus. Click here for more information about fares. Know the safety rules for riding the streetcar and for interacting around the streecar as a pedestrian, biker or driver. The Dallas Streetcar is the first project in the United States to use wireless traction power utilizing an onboard stored energy system as the streetcars cross the Houston Street Viaduct bridge.